UNFORGETTABLE MAGNIFICENT LAKEFRONT PROPERTY WITH PRIVATE BAY IN PACKANACK LAKE.RENOVATED VICTORIAN STYLE COLONIAL. CREATE YOUR GOURMET DINNER IN THE KITCHEN W/GRANITE COUNTER AND TOP OF THE LINE APPLIANCES. BREAKFAST BAR AND SUN-SPACKLED DINETTE OVERLOOKING THE LAKE. ENJOY THE STUNNINGLY BEAUTIFUL VIEW OF THE LAKE FROM EVERY ROOM. HARDWOOD FLOORS, CROWN MOLDINGS AND CHAIR RAILS, BUILT-IN LIBRARY, FORMAL DINING AND FAMILY ROOM W/FIREPLACE. MASTER BEDROOM AND TOTALLY RENOVATED BATH, 2 MORE BEDROOMS W/FULL BATH, FINISHED UPPER LEVEL. FINISHED WALK-OUT LOWER LEVEL LEADS YOU TO PARADISE. 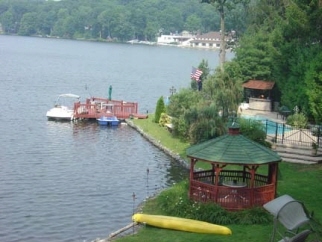 IN-GROUND POOL W/ OUT-DOOR BAR, DOCK FOR YOUR BOAT, FISHING AND SWIMMING. THIS IS A ONE OF A KIND OPPORTUNITY FOR SOMEONE WHO LOVES WATER AND WANTS TO BE IN ONE OF THE FINEST NEIGHBORHOODS. THE OUTSTANDING HOME HAS QUICK ACCESS TO MAJOR HIGHWAYS, IS WITHIN 20 MILES OF NY AND NEAR THE BEST SHOPPING IN NJ.